Topic: How often do you wash your jeans? Re: How often do you wash your jeans? Oh God this is so awful. So awful. But it's awesome. My favorite so far is definitely 2005's winner. (Not posting the exact text, because I'm not in the mood to play copyright law. Find it here ). I'm never going to be able to hear the name "Zorro" again without thinking of that passage. Topic: Good website to host music? Re: Good website to host music? Yes, Soundcloud is ridiculously awesome. 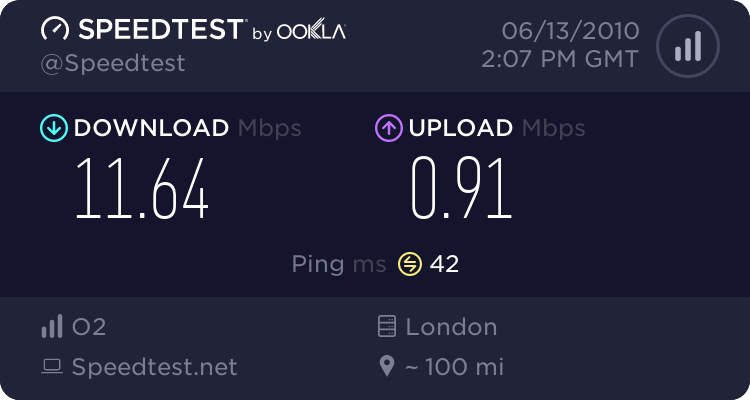 This isn't bad for domestic ADSL in the UK. Some of the speeds in this thread make me very envious! Topic: UK election- GREAT SCOTT, IS THAT AN ELEPHANT? Re: UK election- GREAT SCOTT, IS THAT AN ELEPHANT? Topic: Google to Reconsider Chinese "Approach"
Re: Google to Reconsider Chinese "Approach"
Great stuff. I really hope that they don't end up pulling out of China completely though; although I of course appreciate the dangers of censorship, Google facilitates access to such a wealth of information that I can't help but think it should be there in some capacity. Topic: Headphones that can take wear-and-tear. Re: Headphones that can take wear-and-tear. It's not a huge amount of money compared to what the western world ploughs into blowing people up. It's a question of priorities and it appears that our governments' are all fucked. JG Ballard has passed away, after a long period of illness. It's a terrible shame to have lost such a remarkable talent. Topic: Using TOR at work: Just how anonymous am I? Re: Using TOR at work: Just how anonymous am I? Same here - jQuery has actually made client-side scripting fun! The BBC site has footage of a man involved in a collision between a train and a flatbed lorry HERE. This looks cool - I'm looking forward to trying it out. Topic: Food that gives you headaches or other reactions. . .
Re: Food that gives you headaches or other reactions. . .
Topic: Hummus + x = delicious. Solve for x. Re: Hummus + x = delicious. Solve for x. Topic: NHS to introduce "personal health budgets"
Re: NHS to introduce "personal health budgets"
Darkscull wrote: I'm not sure if the other questions have any solid answers yet but I disagree with any combination of possible answers.